Medent is an all-in-one EMR/EHR and practice management software system that provides a high level of automation for medical practices. It offers various modules tailored to meet the needs of healthcare providers to help them achieve efficient medical records management. KeyMed Partners has been recognized as a Medent Preferred and Recommended Provider and offers the EMR hosting solution. Our expertise will help in guiding you through the EMR implementation process and insure a smooth transition. "Family Practice Management survey of American Academy of Family Physicians members ranks Medent EHR top in overall satisfaction." Once your Medent EMR hosted solution is in place, you can opt to manage the system with in-house staff or utilize KeyMed’s professionals to handle processing your medical billing. With a strong understanding of medical coding and healthcare billing, the professionals at KeyMed Partners are able to maximize the billing process for medical practices of all sizes and medical specialties. KeyMed employees work as an extension of any medical practice’s billing services, ensuring that those practices that employ the Medent software are using it to its fullest capacity to increase both productivity and revenue. Medent EMR is certified by the Centers for Medicare & Medicaid Services (CMS), a complete EHR product capable of "meaningful use" for the purpose of receiving CMS incentive payments. KeyMed’s hosted solution takes the guesswork out of achieving meaningful use. As a Preferred Medent provider, KeyMed Partners has the expertise needed to efficiently handle all the details during implementation and get your EMR software system up and running quickly. We’ll guide you through the entire process to insure a smooth transition. Once your system is in place, KeyMed can also train your employees across the breadth of EMR and billing management process to maximize utilization and increase productivity. Another advantage of using KeyMed’s hosted solution is increased security and HIPAA compliance. No need to worry about data integrity. KeyMed’s hosted solution provides a fully redundant server and network solution in a secure data center. Our data hosting center is fully compliant with HIPAA regulatory requirements. Your continued connectivity to Medent EMR is insured and downtime eliminated with redundant servers across geographically dispersed Internet service providers. The need to constantly replace and upgrade computer hardware and software to keep pace with technology can increase your IT expenses and be a drain on your time. With KeyMed’s Medent EMR hosting you never have to worry about server upgrades or purchasing computer software. Hosted solutions make economic sense for large and small healthcare providers. 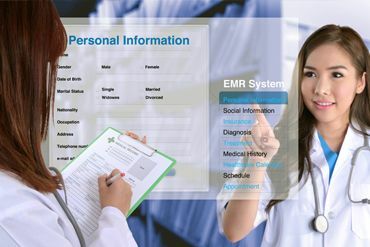 KeyMed’s Medent EMR can grow with your organization. Start with the server capacity that you need and expand in the future as your needs change. KeyMed Partners offers several hosting options, designed to meet the unique needs no matter what your size organization. A monthly server maintenance contract, along with backup media and storage capacity, is included in all plans.